For data to be tracked, Google Analytics must be configured and active on your web site. This can most simply be achieved using a 3rd-party plugin, such as MonsterInsights. Other than that, as long as Cab Grid is calculating prices on your web site, it is reporting data to your Google Analytics account. 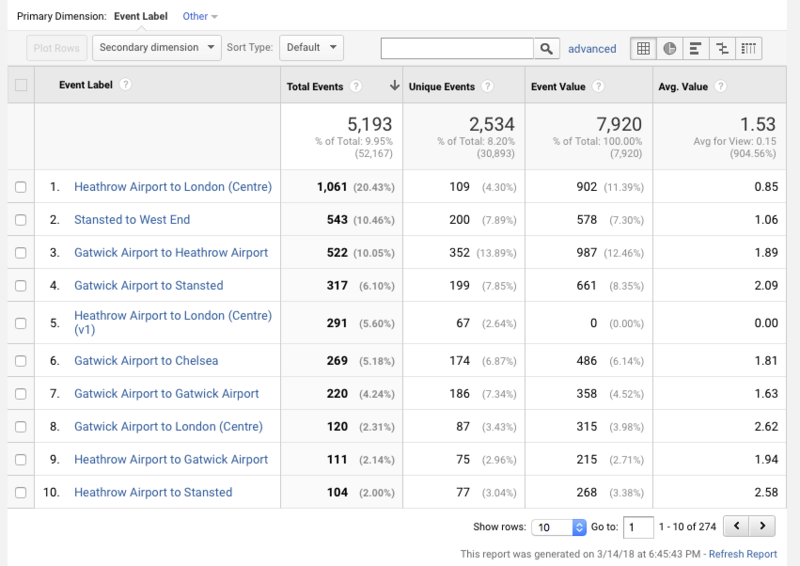 Cab Grid Pro interactions are reported to Google Analytics as Custom Events. 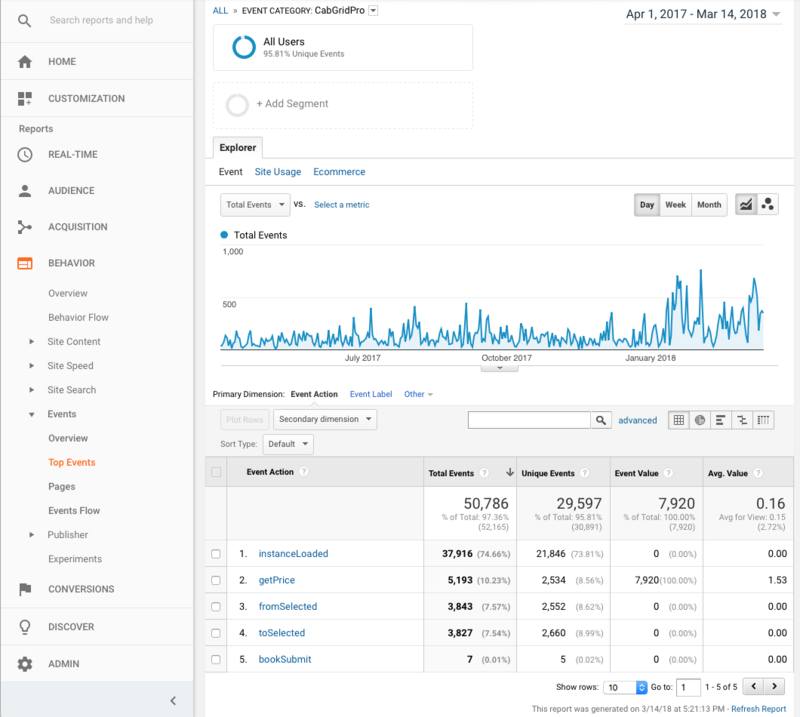 These can be viewed in your Google Analytics Account under BEHAVIOR > EVENTS in the left-side menu. Note: Data is not available in this Analytics report in real time, so a period must be given for data to be collated and an appropriate date range selected (at the top right of the Analytics window). All Cab Grid data is tracked under the Event Category named “CabGridPro“. This is the starting point for exploring Cab Grid usage data. From the BEHAVIOR > Events > Overview page in Analytics, click the Full Report link below the Event Category table. This should then list all custom events recorded in Analytics. Click the CabGridPro item in this table. Each action is accompanied by additional data in the form of a Label and a Value. An overview of what these will be can be found in the table above. These allow further usage analysis. Clicking an Event Action will reveal a report table listing all Event Labels associated with that action. So, if clicking the getPrice event action, a table listing different journeys and the counts of each will be displayed. This could be useful for analysing the most popular routes. This report will also show analysis of the associated values tracked with each label. In the case of the getPrice event, the number of passengers is recorded as a value, so a count of passengers is can be analysed for each journey. It also gives an average value for a given journey. In the case of bookClicked & bookSubmit event actions, the associated value tracked with each event is based on the calculated price for the journey. Google Analytics does not allow decimal numbers as values, so prices are multiplied by 100. (e.g. if the calculated price for a journey is $24.99, Analytics will record a value of 2499).